mouse medicine: happy presidents day! visiting thomas jefferson's home w/my dad and my little sister. charlottesville, virginia, 1969.
coincidentally yesterday c-span released the results of a recent survey of leading historians, c-span asked the historians to rank and rate the presidents. not surprisingly, abraham lincoln tops the list, with george washington following a close second. according to the c-span survey, the highest ranked president from ohio is william mckinley who comes in at #16 (right behind bill clinton) and the lowest ranked president from ohio is warren g. harding who is ranked at #38. even though we are now on #44, there are only 42 names on the list. of course we can't rank president obama since he has just started his first term in office. and presidential trivia buffs may remember that we had one president who served two non-consecutive terms. although this president didn't hail from ohio, at least his name had a connection to ohio for this president was no other than grover cleveland - who by the way, ranked #21 in the c-span survey - which is dead center! for inquiring mice who need to know the results of the c-span survey are here. 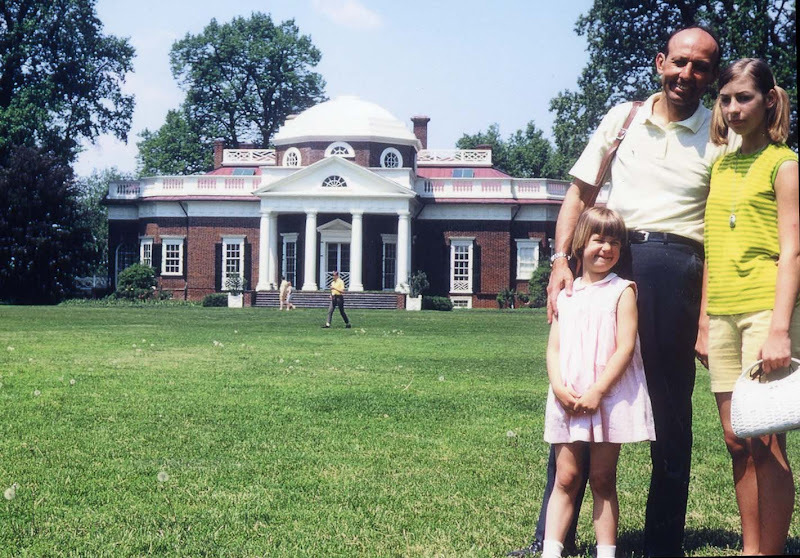 Great 60s pic from Monicello-- I lived in Charlottesville for several memorable years in the 80s, & actually spent a summer working on the grounds crew at Ash Lawn, Monroe's house down the road from Monticello. They say Jefferson wanted Monroe on the lower ground below M'cello so he could keep an eye on him. Great photograph, though I wouldn't say you look so thrilled. :<) My fave pres - Theodore Roosevelt. Then comes John Adams, and then Harry Truman. I've read biographies of each one, and what men they were! Love the photo - especially your purse! We visited there just about 30 years after you did. I was just going to say: love the handbag. I see the feeling is shared. It was interesting poll. I'm suspicious of the criteria, as Kennedy was so high. He served less than three years, was timid on Civil Rights -- the signature domestic issue of his time -- and initiated the accelerated drift into Vietnam. The effort to make these presidential polls non-ideological stymies debate. In terms of accomplishing what he set out to do, I understand Reagan's high ranking. In that light, he could be higher. But whether or not his presidency was good for the country is another matter entirely. Your picture could have been me visiting Monticello! I was there in '69 or maybe '70 with a little sister that looked a lot like yours! My youngest sister is 11 years younger. Warren Harding's home is worth the trip down to Marion to see. I had to go for a visit a few years back after I read Anthony's bio on Florence Harding. I should blog about it. Did you have a smiley face pin back then? I did—one for each point of my unbuttoned button-down collar. Yikes! I grew up in MD, and having a father who loved to jump in the car and just go, we managed to visit a lot of history when I was a kid - Monticello, Mt. Vernon, DC, Philadelphia, Annapolis, Gettysburg... MD, VA, and PA are just full of US history, especially colonial and Civil War. I especially love the shorts with a purse look of 1969. I was gonna say that youngin' looks just like you. There are photos of my sister and I that look similar too. The C-Span poll was interesting. Except for Bush, the bottom group was the presidents that no one really remembers. LOVE the pic of you! What a cute outfit, including your little clutch bag. I wonder what you were thinking about, wandering around Jefferson's house? Do you remember?? I didn't realize your little sister was so little, I thought she was only a year or two younger. You are bothe so adorable! john - I've always loved the charlottesville area; what a great job to have. I can't remember ever having visited ash lawn - which is a shame, we'll have to make a point to visit sometime when we're in that neck of the woods. rlb - I'll keep an eye out for a handbag like that for you! tut-tut - I don't recall having a smiley faced pin. but remember those tiny little bug and animal pins - they were on like stickpins - I remember having pins with heads with ladybugs, cats, frogs and even a turtle on them! roy - my family did the same and visited all those places ....who knows we probably were at the same place at the same time!!! I especially loved visiting colonial williamsburg. and in my family of 'creation' we have carried on the tradition - and love to visit historical houses and 'living museums' such as sturbridge village, shaker communities, ohio's hale farm & village, etc. barbara - maybe I'll find two of the purses for rlb and you! coffee - I don't know jack about the tavern club or grandpa hanna....pray tell, what's the skinny? reya - I remember being fascinated by the place....and have gone back many times since. "k - thanks for the comment - I agree with all points....and add that I expect in 10 years time gwb will be even lower..."
I checked the list again and noticed that he is the lowest two-term president. One of my early visits to Monticello was around the same time. That might be me over by the entry. Love that white purse as well. I've long been conflicted by Jefferson who was visionary but also a slaveholder. There has been much written about the "Jefferson Bible" recently and how he felt all the "magic" and the Trinity needed to be removed. A fascinating thought. And if you consider his overall impact on the world, GWB has to be the worst president ever. How telling that he's below Hoover. Kimy, like others, I have to say -- great purse and contemplative look. And congrats on the comment asking for an interview. You go, girl. no kidding love those pigtails, I just want to squeeze you!